Beatrice 'Bumble B.' Flinn loves a lot of things, but she loves drawing the most. When her friend Rosa's cat goes missing, B. offers to make a poster for her. Mission lost cat is under way! But when no cat is found, Rosa blames B. and her poster. B. is positive her poster will work, and she does not give up! 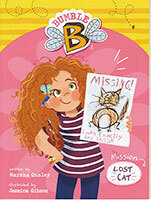 The Bumble B. early chapter book series will inspire young readers to have confidence and a positive attitude. Easy-to-read text, short chapters, fun illustrations, a glossary, discussion questions, and writing prompts complete the book.